The bay platform at Greenford station. A Paddington train awaits departure. 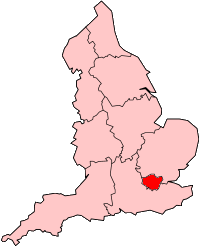 The Greenford Branch Line is a 2 3⁄4-mile (4.4 km) Network Rail suburban railway line in west London, England. It runs northerly from a triangular junction with the Great Western Main Line west of West Ealing to a central bay platform at Greenford station which is also on the London Underground Central line. A triangular junction near Greenford connects to the Acton–Northolt Line (formerly the New North Main Line). The line serves mainly the suburbs of Ealing and Greenford. The passenger service is provided by Great Western Railway. Trains from the branch continue on the Great Western Main Line to reach Paddington, typically in 24 minutes, and call at the three intermediate stations: West Ealing, Ealing Broadway and Acton Main Line. All services are operated with two-car Class 165 Turbo diesel trains. There is no Sunday service. A Class 121 railbus in BR Network SouthEast livery at London Paddington station for the Greenford service (1988). The opening of the line in 1903 coincided with the opening of a station at Park Royal on the Acton-Northolt Line to serve the Royal Agricultural Show held in the grounds of part of the Twyford Abbey Estate. The Show ran from 15 June 1903 to 4 July 1903 during which period trains operated a circular service to and from Paddington via Park Royal and Ealing. Normal services started on 2 May 1904 and the links to Greenford station were put in on 1 October 1904. The loop formed by the GWML, the branch and the ANL is sometimes used for turning trains for operational reasons such as balancing wheel wear. On weekends in 2008 during engineering works on the West Coast Main Line the line was used by Virgin Trains' Euston-Birmingham International "Blockade Buster" service which ran to Euston via Willesden, Acton Main Line, Ealing Broadway, Greenford, High Wycombe, Banbury and Coventry using pairs of 5-car Voyager sets. On two Sundays in February 2010, Chiltern and Wrexham & Shropshire trains were diverted to Paddington via the line while engineering work blocked the route to Marylebone. Locally the service is called the 'Push-and-pull', a term which dates from the days of steam, when the engine could not change ends at Greenford and so the locomotive pulled the carriages one way and pushed them on the return run (see GWR Autocoach). In the 1950s the service frequently ran with two auto-trailers, one either side of the engine. 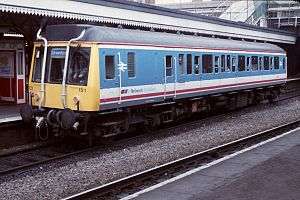 During the 1960s and '70s the service was normally operated by a Class 121 'Bubble Car' two-carriage diesel railcar, although this was later reduced to a single carriage. As Drayton Green, Castle Bar Park and South Greenford have short platforms the maximum length of train that can be used is two cars. In 2017 Crossrail is due to begin using two of the four tracks of the Great Western Main Line and the Greenford service will terminate at West Ealing, rather than continue to Paddington, to obviate interference with Crossrail, and to create track capacity for increased services to Heathrow. In compensation the branch line service will increase from two to four trains per hour. Ealing Council desires to have the line connected to the south west to Clapham Junction via the West London Line, and to the north west to West Ruislip. These are statistics of passenger usage on the National Rail network along the Greenford Branch Line from the year beginning April 2002 to the year beginning April 2011. At Paddington: London Underground Bakerloo, Circle, District (Wimbledon branch), and Hammersmith & City lines. MacDermot, Edward Terence (1931). History of the Great Western Railway. Volume II, 1863-1921. London: Great Western Railway Co. OCLC 55853736. Network Rail (2007). "Current Timetables, Electronic National Rail Timetable (eNRT)". Network Rail. Retrieved 2007-06-11. 3 Western (Map) (4th ed.). Railway Track Diagrams. Cartography by John Yonge. Trackmaps. November 2005. ISBN 0-9549866-1-X.